If you have to make a choice on which museum to go first on your museum day visit, assuming you’re planning to put aside a day on your weekend to play an active role in preserving the nation’s heritage, you could always go to the oldest one. And by all counts, the oldest museum in town has got to be the National Museum. Opened to the public in 1778, the National Museum displays various pre-historical and historical items from the Stone Age, including artifacts and relics. Preserving the nation’s heritage dating back to the 18th century, it has a range of bronze and gold collections from the classical period of Indonesia. It also has the most complete collection of Chinese ceramics from the Han, Tang and Ming dynasties. Arrange a visit between 8:30 am and moon any day except Monday, and you may be astounded by the ancient beauty of Indonesia. 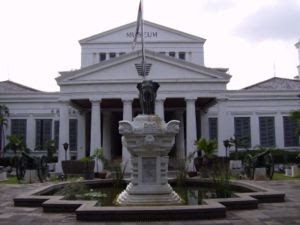 The National Museum, in Taman Merdeka Barat 12, Jakarta.